Author John Corby also writes as "Bulldogge" for the British Canadian newspaper. A nod is as good as a wink to a blind horse, so they say. If you have enjoyed the verbal high jinx, tall stories, light-hearted slander and muck-throwing here at Blighty's Blog, give a nod - or a wink, if you prefer - to our new home. All your favourite correspondents such as Elizabeth Scorgis at Buckingham Palace, Ben Bigge in Westminster, Pen Altekik on the sports desk, Skep Tikk on the weather desk, C. Lee-Sossedge and others too numerous to mention are moving with us. You'll find us all casting aspersions, spewing mendacity, hyperbole and calumny (all in good fun, of course) at our new home on the web: TheFamelessScribe.com. Come on over and enjoy a little satire directed towards the motherland of the Great British Empire from a little snow-covered corner of that empire - in Canada. Oh, and please turn off the lights when you leave here, there's a good chap. Why Do Spanish Ships Have Glass Bottoms? Today is St Valentine's Day. A day to celebrate Britain's love for playing the game of naval conkers with our friends from Spain. For it was on St Valentine's day in the year 1797 that a small British fleet met a much larger force from Spain offshore from Cape St Vincent on the coast of Portugal. During the engagement, the Royal Navy deployed a very large number of its best cast iron conkers and convincingly defeated the Spaniards. The Battle of Cape St Vincent was just a single action in what became a thoroughly comprehensive thumping of the Spanish by the Royal Navy. With British assistance, over the course of a couple of hundred years, the Spanish navy involuntarily redeployed a very large part of its fleet to its "submarine" division. Spanish submarines of the 18th Century were not entirely dissimilar to its formerly magnificent fleet of surface galleons. The main distinguishing features being the absence of masts and the very large collection of wooden splinters on their decks. 18th Century Spanish submarines were also noted for the ease with which they descended to the sea bottom and their innate incapability of rising to the surface again. But, nonetheless they were a magnificent sight to behold. Beautiful wood carvings and ornate deck accoutrements. Thus, when the Spanish government realized the need to replenish the fleet, it sought to recoup some small part of its investment in the old fleet with one design modification. Henceforth Spanish ships of the line would be built with glass bottoms - so that Spanish sailors could see the old Spanish fleet. But, back to our story of the St Valentine's day action at Cape St Vincent. The Spanish fleet was shrouded in fog as the British fleet under Admiral Sir John Jervis on board HMS Victory approached. Lookouts on board the vanguard vessel reported back to the flagship on the strength of the enemy. "There are eight sail of the line, Sir John"
"There are twenty sail of the line, Sir John"
"Hmmm, fetch my scarlet waistcoat, they shall not see English blood if I should fall. Sail on!" "There are twenty seven sail of the line, Sir John"
"Oh, buggah; better fetch my brown trousers too." On that memorable day a British fleet of 15 ships defeated a Spanish fleet of 27 ships. British losses included 73 dead compared to 1000 killed on the Spanish fleet. Admiral Sir John Jervis was handsomely rewarded in cash and honours. The Spanish admiral, Don Jose de Cordoba was disgraced and discharged from service. Another reason to celebrate St Valentine's Day perhaps - unless you are Spanish that is. "The damn insolence of it! Bloody foreigners popping over the pond trying to tell Britain how to take care of the economy! Damn jumped-up Canadian chappie, what's his name? Oh, Carney, that's it. Just who, in the blazes, does he think he is? And (excuse me one minute while I froth at the mouth), how much did you say we are going to pay him? Whattttt??? How much??? Dammit man, have you taken leave of your senses? Don't you know the Old Lady of Threadneedle Street has a pay freeze policy? We pay old Mervyn (Sir Mervyn King; current governor of the Bank of England) just over £300,000, barely enough to pay a chap's bar bill at the club I know, so why are we going to pay this new colonial chap nearly three times that? And, of course I have to ask, is he the right sort of chap? You know, old school tie and all of that?" Cost of Canadian bank bailouts during the financial crisis: $0. 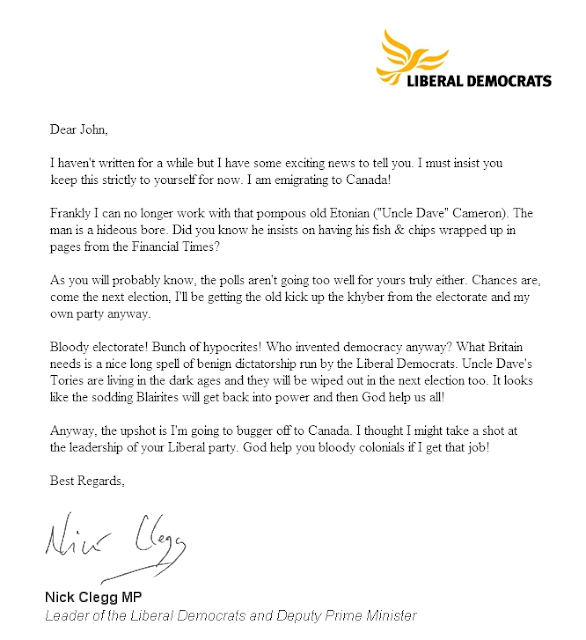 Nick Clegg Emigrating to Canada? Received the following letter by email from Old Nick this week. Curiously, and frankly ominously sinister, is the fact that the original document was precisely 666 pixels wide. The sign of the beast indeed! 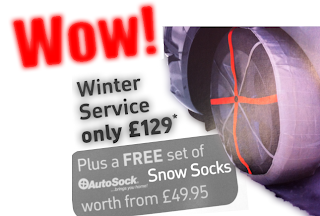 Snow's Stopped - Take Your Socks Off! We are having a spot of winter here in the United Queendom again this year. And, damn it, the Great British snow plough was sent up to Scotland just before Christmas and now it's in for its annual service. Won't be able to get it back down the motorway again until the end of April. Blast! Still, never mind, the boffins have come up with a splendid idea to help motorists cope with that bloody awful white stuff. It's a new invention called "Snow Socks". Brilliantly simple really. Just pop the socks over the jolly old car tyres and Bob's your uncle - no more piggy-stuck-in-the-ditchy for you. Here's how to do it: wrap the socks over the top of the tyres on both wheels on the drive axle, then pop back into the car and drive it forward a couple of feet then simply slip the bottoms of the socky-wockies over the rest of the tyre and bingo, you're off to the races! It's a snap, you'll have it down pat as quick as you can say "watch out uncle Willie, there's a lorry coming!" Now, don't forget, when you get back on to a dry road you'll have to pull over and slip the socks off again. You don't want to be caught driving on a dry road with your socks on because they'll turn into shreddies very quickly if you do! The Met Office has issued a warning to motorists throughout the British Isles. Temperatures are expected to drop to near freezing tonight as a cold front moves in from the Irish Sea. Motorists are advised to stay at home unless travel is essential. If you have to venture out onto the roads, police are advising motorists to wear a double layer of socks ... on their tyres. In the wake of historic riots devastating London and other cities, the British government has stepped in with an iron fist to take control of law and order. 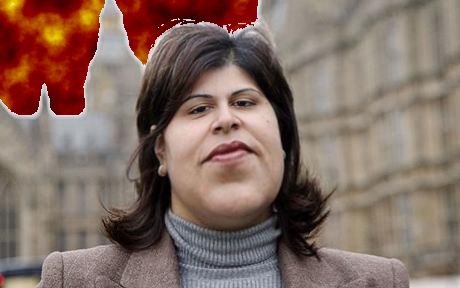 Government spokesperson Baroness Warsi, speaking in a BBC interview this morning, assured the public that the "police are in control". Millions of British people will sleep sounder in their beds tonight with that re-assurance, I am sure. Meanwhile, prime minister David Cameron, fresh from his vacation in Italy is primed to sweep into action with a heavy hand. "We will not hesitate to recall parliament and immediately - I say immediately - form a committee to study various courses of action available to the authorities". A spokesperson for the rioters, heard on the BBC, claimed "it's all the fault of the govinment (sic) and the rich people". Indeed, the riot spokesperson may have hit the nail on the head. If only Mr Cameron had had the cajones to form a parliamentary committee to study the situation before he went on vacation. Tsk, tsk. All three Harrys in this strange tale were British. All three were famous and all three are dead. What is strange is how one of the Harrys made the other two happy Harrys by mistake. Let us start with the first Harry. He was James Harold Wilson, Baron Wilson of Rievaulx, KG, OBE, FRS, FSS, PC, better known simply as Harold Wilson, the pipe-smoking prime minister of Britain from 1964 until 1970 and then again from 1974 until 1976. The second was Harry H. Corbett, born in Rangoon, Burma, the son of a British army officer. Corbett earned fame as an actor for his role as Harold Steptoe in the hit TV show "Steptoe and Son". He was also a strong supporter of the British Labour Party and a friend of Labour prime minister Harold Wilson. The third Harry of this strange tale was the very similarly named Harry Corbett, the son of a coal miner. Harry number three was deaf in one ear which halted his ambition to become a musician. However, he did achieve fame in the entertainment world as a puppeteer with his stage and TV act involving a mischievous teddy bear called "Sooty". 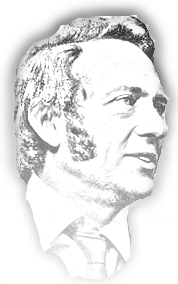 The first Harry, the prime minister intended to honour his friend and supporter Harry H. Corbett with an OBE (Order of the British Empire). 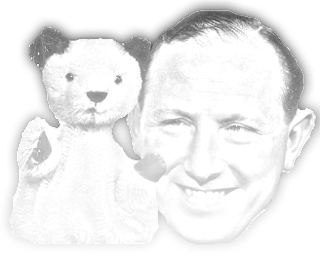 But, due to bureaucratic bungling, the middle initial "H" was dropped from the paperwork and the honour went by mistake to Harry H-less Corbett - the puppeteer. The error must have embarassed the prime minister and disappointed the intended recipient who was nevertheless also rewarded with an OBE in the new year's honour list of 1976. The moral of the story is "never drop your H's".